Eleanor Bartleman was brought up on Scotland’s Ayrshire coast. She studied ceramics at the Glasgow School of Art, completing a postgraduate year of study in 1979, and set up her first workshop soon after. Initially working in earthenware, she pursued her interests in mythology and, in particular, the Beast Epic of Reynard the Fox, taking various strands of mythology and developing her own style of figurative ceramics. 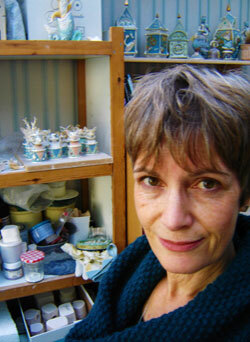 She quickly established a career as a ceramic artist making and selling to a wide range of quality outlets in the UK. Eleanor was a lecturer in ceramics for several years before returning to full time making, this time concentrating on porcelain. She has been based in North Devon since 1990. She is an elected member of the Devon Guild of Craftsmen.